The Aquaspace carafe is ideal for the office, for those who want to try the filter before buying a larger unit, and for those who don’t have room for a kitchen filter. The patented Aquaspace media reduces chlorine, chemicals, bad taste, dirt and sediment. Available with several options, including fluoride removal and alkalizing cartridge (increases pH up to 9.0, depending on water source). This unit gives you the utmost in flexibility: If you move from a non-fluoridated area to a fluoridated area; or if you want to try the alkalizing filter, all you have to do is change the cartridge! Standard filter lasts for 500 gallons, or one year; filter with fluoride removal or alkalizing media lasts for 250 gallons or 6 months; filter with all three media (regular filtration, fluoride removal, and alkalization media) lasts 125 gallons or three months. 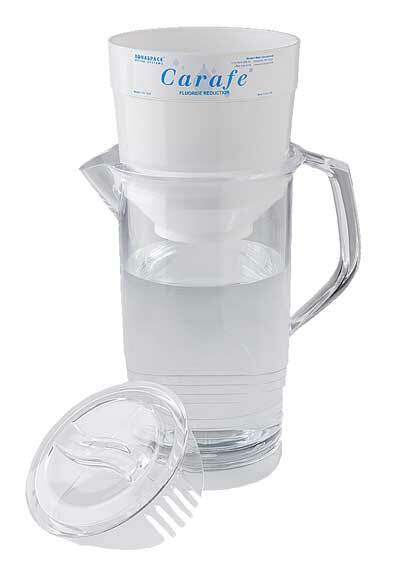 Clear polycarbonate (BPA-free) carafe holds 60 ounces (almost a half-gallon). Note on returns: Used carafes are subject to a 15% restock fee. Click here for replacement cartridges. Note on returns: Units that have been used will require the filter to be replaced. The cost of the replacement filter will be deducted from the refund. We installed a whole-house filter that filters out biological material but not dangerous chemicals. We got the Aquaspace Carafe for drinking and cooking and noticed a much better taste but also improvements to our health (we have copper pipes, and so does our municipality for pipes beneath the ground). We're grateful for it.